Anna is available for consultations in South West England. Visits outside of this area will be considered on an individual basis. Consultations will be carried out for any equine including horses, ponies, donkeys and mules. All consultations will be carried out following consent from your Veterinary Surgeon. This is essential due to the possibility of the problem being related to any underlying medical problems and for legal and insurance purposes. The initial visit will take up to three hours. A detailed history will be taken covering all aspects of your horse's behaviour, management and training regimes, to help Anna to learn the motivations behind your horse's problematic behaviour. This will require a quiet, private place where disturbances will be minimal to ensure that you get the best from your consultation. Following the history taking Anna may request to observe your horse in it's current environment and you interacting with your horse. Please remember that this part of the consultation is in no way pressured or any form of test, but is simply an opportunity to get a full picture of your current circumstances to ensure Anna is able to formulate the most suitable behavioural modification plan to help you and your horse to move forwards confidently together. At the initial consultation Anna will provide you with immediate advice on how to manage the problem and create positive change in your horse's behaviour. Following the consultation, you will be provided with a full written report about your horse's behaviour and the motivations behind it. A copy of this report will also be sent to your vet. Follow-up visits can be arranged on a regular basis, or at intervals to suit you to ensure that you and your horse are on the correct path, making positive progress and to help address any concerns that may have come up during the implementation of the behavioural modification programme. Anna is available for one to one training sessions with you and your horse to assist you with any problems that you may be having where a full behavioural consultation is not required. Anna can provide training sessions for both ridden and in-hand issues where you feel that you would benefit from some extra support. Veterinary referral is not required for training sessions. 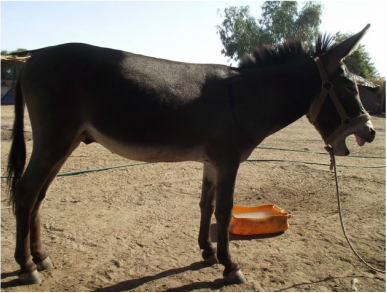 If you want to improve your understanding of your horse or donkey's behaviour a training session may be just what you need to learn how to communicate with him/her better. If you are a new horse owner and you would like to make sure that you are doing things in the best way possible for your horse a training session will be beneficial in helping you to progress positively together. In some cases the problems mentioned above may require a full behavioural consultation. These prices are inclusive of a full written report and telephone/email support for a period of one year. * Consultation price does not include travel costs. For all consultations the first 20 miles of travel from Colyton, Devon are free of charge. Further travel, including return journey, will be charged at 45p per mile. Mileage will be charged for behaviour consultations and training sessions.